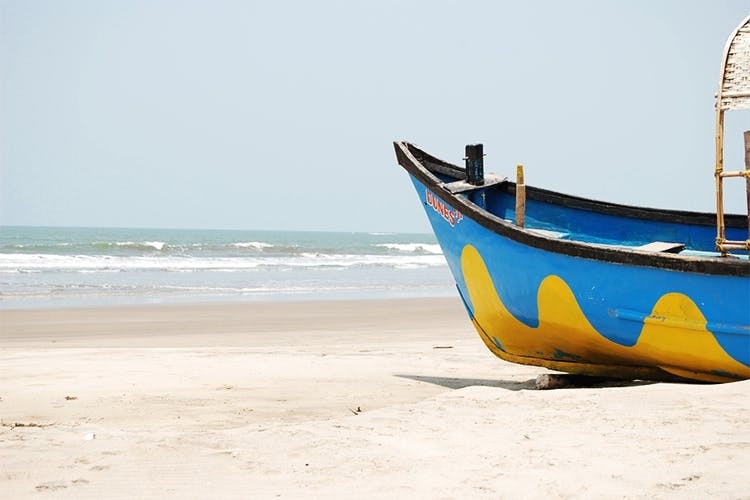 Hidden between the ever-popular beaches of Ashvem and Arambol, is the forgotten and often ignored Mandrem Beach. It is Goa’s best-kept secret beach we say. It is one of the cleanest and most beautiful beaches in Goa. With white sands and clear waters, one can just sit back, relax and enjoy the tranquil ambience of this beach. If you are looking for crowds, noise, people then this beach is not for you. This beach offers solitude, clean white sands, relaxing and soothing sounds of the waves. The best part about this beach is the small ankle deep creek, which runs throughout most of the beach parallel to the waterline of the shore. Some of the hotels on the shore have even filled small wooden bridges to cross this little creek. Come high tide, the water level increases occasionally to knee length, but it is a great spot to just sit and wade in the waters of the creek if you are not a swimmer. The beach is host to the Frisbee players, a forgotten sport and one that is still great fun. One can just watch or even join in the fun. So if you are a Frisbee enthusiast then you should head to this beach. They have even hosted a Frisbee tournament here last year, and will probably do so again. Mandrem village also has an old, small Portuguese fort which is also visible from the beach. There are not a lot of shacks on this beach, but two of the favourite ones here are End of The World & Sunset Mandrem Shacks. And they are open only for a few months from November till May. But these are great places to enjoy your sundowners, whilst watching the glorious sunsets or just enjoying the lovely breeze. They serve Goan as well as some Continental food, and like most shacks in Goa allow you to bring your pet along. Pack a picnic and head there for some romantic sunsets.